Trumpeter, Tomasz Stanko, is in that most fortunate of positions of not just having a quartet that understands his music perfectly, but has two with his Polish quartet and the New York Quartet featured on his latest release December Avenue The new album, some four years on from the groups excellent Wislawa set, sees one change in personnel with Reuben Rogers on bass who has quickly found himself place in the quartet, and in establishing quite a rapport with Cuban born pianist, David Virelles and drummer Gerald Cleaver. One of the most interesting facets of Stanko's music, and this album is no exception, is that nothing immediately jumps up and grabs you but every little gesture, note and nuance is captivating. 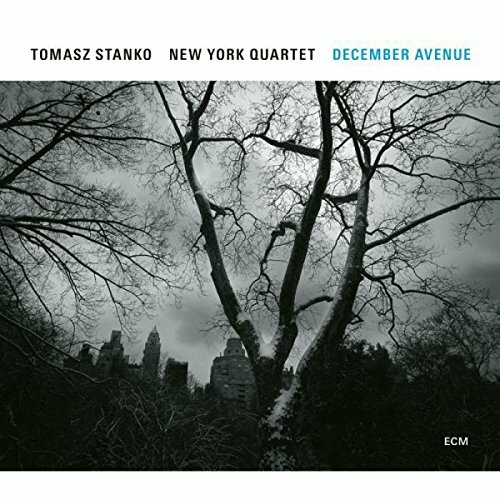 Often described as dark and melancholy, the trumpeter must be mellowing as there is a definite sparkle in much that Stanko plays. The early influences of Chet Baker and Miles Davis are now firmly in the past and Stanko has in his possession a distinctive and individual voice that is readily identifiable. The music on December Song is varied and wide ranging, from the effervescent and bubbling lines heard on 'Burning Hot' with the trumpeter spitting on short staccato notes in all directions, and a light playful solo tinged with a darker hue from pianist Virelles the tension is cranked up a notch throwing into sharp contrast the gentle lyricism of the opening 'Cloud' with the brooding opening chords from the piano. 'Sound Space' is just as the title suggests, with gentle bass introduction and atmospheric and ethereal notes from the piano that hang in the unresolved in the air, before becoming more turbulent. Credited to all four musicians, this is the longest of what is perceived as freely improvised pieces that add to the variety of the set, and yet flow smoothly within the overall concept of the album as a whole. 'Sound Space' is followed straight away by the title track that has the most declamatory playing from the trumpeter on the set, playing over a spritely motif from Reuben Rogers, Stanko takes the bull gently by the horns in a solo that is intensely lyrical and upbeat, and followed in a similar fashion by Virelles in a fine outing that is then surpassed in his exemplary, driving and exciting solo on 'Yankiels Lid'. What is most impressive about this superb set is how the quartet have gelled so rapidly into a unit that works from minimal (or no written themes) and allows their intuition to take over whilst retaining the ability to move as one wherever the music takes them. The relationship between David Virelles and Gerald Cleaver that was evident on the Wislawa album has developed and solidified into something formidable, yet not so set in stone that they were unable to embrace the playing style of Reuben Rogers into the ensemble. All in all this is a wholly satisfying performance from start to finish, and highly recommended.